Fourth District Councilman Curtis Jones is the sponsor of a billboard bill, No. 180387, that re- zones a narrow strip of land zoned for Parks and Open space in Fairmount Park to I-2 (Medium Industrial) zoning. Sign the petition against the billboard! The zoning change is intended to allow the erection of a double-sided digital billboard within an area of West Park between Montgomery Drive and the Strawberry Mansion Bridge. The area is surrounded by parkland not far from the Bill Pritchard Riding Academy, within 660 feet of Belmont Plateau and 225 feet of Martin Luther king Drive. The spot zoning is intended to allow a section of a railroad right of way to be used for a billboard. The strip of land is adjacent to I-76. The Federal Highway Beautification Act strictly prohibits billboards in parks and open spaces and forbids spot zoning to erect billboards. PennDOT is now charged with enforcing the federal and state billboard laws in Philadelphia and they have been made aware of this bill. Sign this petition against the legislation. Attend Rules Committee hearing – May 23 10AM. City Hall Rm 400. At a public hearing on November 1st the Philadelphia Art Commission voted 7-to-1 to grant approval for a private company to install 100 advertising kiosks on city sidewalks, despite objections from several neighborhood organizations and many residents. The kiosks still need approval from PennDOT, the agency responsible for ensuring Philadelphia’s compliance with federal outdoor advertising regulations which would apply to most of the streets where the kiosks are proposed. Scenic Philadelphia will be coordinating with PennDOT and federal regulators to ensure that any proposed kiosks do not violate federal laws. Sidewalk kiosks in New York City have become hubs for loitering and illicit activities. During the hearing the chairman of the Philadelphia Art Commission, Alan Greenberger, asked representatives from Intersection, an outdoor advertising firm, and the city’s Office of Transportation and Infrastructure Systems (OTIS) a very direct question: “What would you like us to do?” Unfortunately, the Art Commission gave the advertising firm and OTIS exactly what they came for. A motion for approval of the ‘Link’ advertising kiosks in Philadelphia was passed swiftly by a majority of the commission. Intersection and OTIS proposed several possible sites for the kiosks on the sidewalks of wide streets, such as Market and Arch, as well as the narrow streets of Old City. Their presentation highlighted the free Wi-Fi, outreach to local businesses, public service announcements about civic events, and cell phone charging ports that the kiosks would bring to people, but failed to address many of the concerns members of the public and neighborhood groups expressed about the kiosks. There was additional concern expressed by civic leaders about the lack of public notice and input on a proposal that would have a profound impact on the public space. A representative from the Crosstown Coalition of thirty civic associations testified to the Art Commission that no one from OTIS or Intersection had reached out to their neighborhoods about these proposed kiosks. These civic associations reached a unanimous decision that without any information they would not support the kiosks. A resident of Old City, Rob Kettell, frankly told the art commission that the kiosks would not fit in Old City, explaining that the streets of Old City are too narrow and crowded to accommodate these 9-foot tall and 3-foot wide kiosks. He also felt that an environment with these continuously changing ads would be hazardous to pedestrians and drivers on Old City’s streets. Mr. Kettell said that the kiosks’ unsightly appearance would not look natural with Old City’s rustic and authentic appearance. Scenic Philadelphia’s executive director, Mary Tracy, testified about the potential degradation these kiosks could have on Philadelphia’s historic appearance and character. Ms. Tracy said that the city needs to be aware of the numerous public nuisance issues the kiosks have led to in New York and asked the commission to consider the long-term impact that these kiosks may have on Philadelphia. She ended her testimony with an appeal to consider the impact that taking away public space would have on the people of Philadelphia. The president of The Society Hill Civic Association, Roseanne Loesch, also testified to the art commission that her group was very concerned about the lack of public awareness and participation in the kiosk program approval process. She asked for public hearings regarding the kiosks, and posed a final question to the commission: why should private, for profit businesses be given public space for ads? Only one member of the commission, painter Joe Laragione, found it disconcerting that of nearly 200 letters the commission received regarding the kiosk proposal, all but 3 were opposed to the proposal. He remembered what other members of the commission seem to have forgotten: the purpose of art commissions is to steward public space on behalf of the public and to protect and promote the good visual character of the city’s streetscapes. Mr. Laragione’s stated that if such a large portion of people in Philadelphia did not want these kiosks, then they should not be approved. At this point art commission chair, Alan Greenberger, again asked Intersection what they wanted from the Philadelphia Art Commission. Intersection clearly stated this time what they came for: approval for the kiosks. Despite Joe Langione’s sincere words and great public testimony, a motion for the approval of the kiosks was passed by the majority of the art commission. Brendan McDevitt is a Temple University student with a keen interest in urban development and public relations. This was his first time attending an art commission hearing. Thank you to all the residents of Philadelphia that wrote to the Art Commission about the advertising kiosks! Your voice plays a vital part of the city’s decision making process. For all people that have not had a chance to write to the Art Commission yet, Scenic Philadelphia still urges to do so since it is not too late! Send a letter to the Art Commission, here! The Art Commission will reopen Intersection’s case for digital advertising kiosks this Wednesday, November 1st, at 1515 Arch Street–Room 18029 on the Eighth Floor. The meeting opens at 9:30 AM, and Intersection’s case is first on the Art Commission’s agenda. Scenic Philadelphia asks any member of the public to come to this open meeting at 1515 Arch Street- Room 18029 to testify to the Art Commission on how these kiosks will affect you and your view of Philadelphia’s appearance! Your participation is so important to us and to your city! Scenic Philadelphia hopes to see you Wednesday morning! The sidewalks of Philadelphia may soon be marred with the addition of hulking advertising kiosks if an advertising company’s proposal is approved by city officials. The Philadelphia Art Commission has given conceptual approval for the kiosks, and it is important that they hear from the public before they give final approval for the kiosks. Click here to let city officials know you don’t want these kiosks on our city’s sidewalks. Rising out of the ground like unsightly pillars, similar kiosks have already caused a stir in New York City, where they were installed in January of 2016. Kiosk operators tout supposed public benefits of the structures, including free public WiFi, phone charging stations, and a built-in-tablet that can used to browse the internet, but the majority of the structure is composed of LED screens that flash distracting advertisements to both pedestrians and drivers. Aside from the kiosks being detrimental to the unique and authentic appearance of Philadelphia, there are several issues that have emerged with these kiosks in New York City that will surely arise in Philadelphia if they are approved by the Art Commission. New York City officials began receiving complaints about the kiosks shortly after their installation. The kiosks quickly became gathering places for people looking to make use the free Wifi, internet access and phone charging ports. Small encampments began to grow around the kiosks, with people dragging newspaper vending boxes, discarded furniture and other objects to the kiosks to act as impromptu furniture from which to use the kiosks for hours at a time. City officials in New York like Bronx Borough President Rubèn Dìaz have raised concerns about these people creating personal spaces for themselves by the kiosks where drugs and alcohol are consumed publicly. Such uses of the kiosks are creating major public nuisances for city residents like Judith Barnes, a resident of the Cobble Hill neighborhood in Brooklyn, who told the Brooklyn Daily Eagle that a “massive” kiosk was installed just a few feet from her front window. She described the new kiosks as an eyesore in her neighborhood that creates light and noise pollution issues for she and her neighbors. Ms. Barnes is also worried about people attracted to the kiosk congregating on the sidewalk in front of her home, and of the potential for personal privacy invasion since the kiosks have built in cameras. New York City government provided no opportunity to be a part of the decision-making process about these kiosks before installing them in neighborhoods, a move that is being mirrored by the Philadelphia officials. Intersection, the advertising firm behind the kiosks in New York and potential kiosks in Philadelphia, is preparing a mock kiosk for the Philadelphia Art Commission. If they receive the Art Commission’s approval for the kiosks then Philadelphia will soon be oversaturated with distracting and unsightly advertisements on almost every city block in Center City, not to mention the public nuisance risks posed by the kiosks. It is important that you contact the Art Commission today to let them know you disapprove of this proposal for commercial advertising kiosks on Philadelphia’s city streets. Amidst a push to light up our city with digital advertising, one digital sign visible from the Schuylkill Expressway and the Spring Garden Bridge sits dark. Thanks to the Department of License & Inspections, Streets Department, and Law Department’s combined enforcement efforts, the billboard company’s attempt to circumvent the law was caught and sign went dark. now features a beautiful mural instead of the previous unsightly and illegal conduit. Philadelphia allowed the non-conforming Spring Garden bridge billboard to convert to digital based on a now changed memo from Law Department. However, no structural changes were allowed to be made to the billboard. When applying for the permit to change the sign from static to digital, Steen testified that no structural or electrical changes to the non-conforming billboard would be needed to convert the existing billboard to digital. A prohibited sign shall not be reconstructed if for any reason it becomes necessary to replace the entire sign, including the sign face, the farm and any supporting mechanism. Stories of circumvention, deception, and law breaking by the Philadelphia billboard industry are common. We are thankful to have city leaders are willing to enforce the law and hold billboard companies accountable for their actions. Finally, we are thankful for the public who inform us of suspicious activity surrounding billboards. The darkening of the Spring Garden sign started with a complaint filed by Scenic Philadelphia in response to a Powelton Village neighbor’s report. With your help we can have more signs go dark and/or come down! On January 4th 2017 a proposal was brought before the Art Commission to erect a new billboard on the Parking Authority parking lot located at 1339 S. 12th Street, one of five billboards PPA plans to erect on its lots located around the city. This prohibited billboard, across was removed from the PPA parking lot at 1339 S.12th across from Colombus Square. Neighbors oppose a proposal to erect new larger billboard . These proposals are the result of the little known 2013 amendment made by City Council exempting municipal properties from our billboard laws 14-905 (15) (c). PPA proposes to erect these billboards within 660 feet of a parks, schools, and playgrounds which are prohibited areas 14-905 (10) (n) and (o). If approved by the Art Commission, PPA’s proposal will turn billboard law on its head, allowing billboards near homes, schools, parks and playgrounds throughout the city. Write to the Planning Commission today and request that the regulations comply with all zoning regulations governing accessory and non-accessory signs. PPA rendering of proposed billboard is misleading. The actual billboard will be 2 stories high. On January 4th, the Art Commission will vote to approve deaccession of Pablo Tauler public art on bus shelters along Chestnut Street in Center City between 7th and 17th street. The bus shelter public art is part of the Philadelphia Redevelopment Authority (PRA) Percent for Art program. The program requires developers who are building on land acquired and assembled by the PRA to dedicate at least one percent of the total building construction costs toward the commissioning of original, site-specific works of art. Septa will replace the art bus shelters with new shelters and commercial advertising space, further deteriorating the quality of Philadelphia’s streetscape and public space. Sacrificing public art for commercial advertising space is another example of city officials devaluing our public space. Join us at the Art Commission meeting on January 4th at 9:30am at 1515 Arch St on the 18th floor where we will be a public voice for public space or send email to the Art Commission to voice your opinion – artcommission@phila.gov. Also on the agenda is an outdoor advertising display proposal for 1339 South 12th Street on a PPA parking lot. The lot is directly across from a park, surrounded by residences, and is another example of the continued encroachment of advertisements on public space as a result of a bill passed in May 2013 that allows ads on city-owned property. Philadelphia is not New York. Market East is not Times Square. 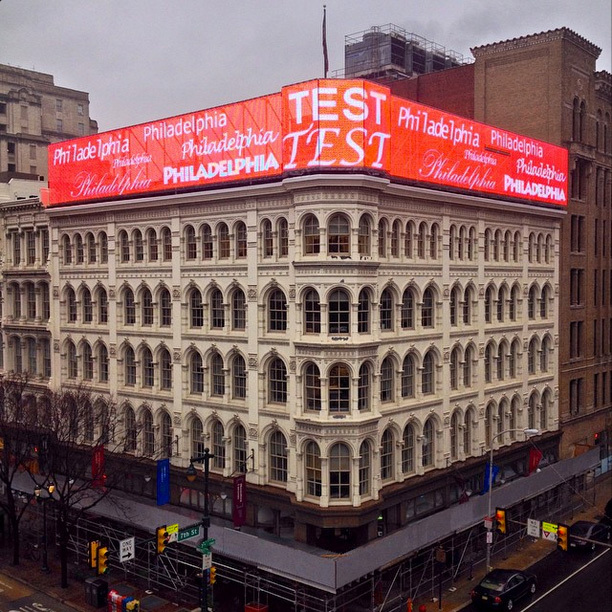 As architecture critic Igna Saffron explains, Philadelphia’s attempts to make the Market East Corridor what it is not have resulted in conflicting commercial and residential interests as well as the city losing control of its digital sign authority. The Federal Highway Administration (FHWA) has turned over responsibility of all federal and primary aid highways in Philadelphia to PennDOT. Earlier this year, an initial move revoking Philadephia’s certification and returning to state control had exempted the so-called “Market Street East Sign District,” but the new FHWA announcement transfers all control to PennDOT. For the past four decades Philadelphia was allowed by the State to enforce the provisions of the federal Highway Beautification Act (HBA) within city limits. The Act requires Pennsylvania to maintain control of outdoor advertising and ensure protection of the public’s investment in roadways, promote driver safety, and preserve the scenic beauty of the our roadways. Failure to uphold the Act can result in a penalty of a 10 percent loss in the state’s federal highway funding. When Philadelphia lost the privilege to regulate signage in April 2015, the “Market Street East Sign District” was initially exempted from state control. But after further review and public input, FHWA made the decision to further revoke Philadelphia’s control over Market Street East as well. Please join us for Scenic Philadelphia’s Summer Soirée, celebrating 25 years of protecting the visual character of Philadelphia’s neighborhoods and the beauty of its scenic vistas, on Wednesday, July 13 from 6:00 to 8:00 PM at the Presidential City’s Sora Pool Club. If you have any questions regarding tickets please call Scenic Philadelphia at 856.428.7585. Complimentary valet parking included with your ticket! Philadelphia City Council’s Rules Committee will hear testimony regarding Pennypack Park Rezoning Bill NO. 160275 to rezone a parcel of Pennypack Park for industrial use, accompanied by Pennypack Park Billboard Exemption Bill NO. 160276 to allow Keystone Outdoor Advertising to erect a 55 foot high digital billboard on the rezoned parcel. The bill removes a critical buffer bordering the banks of Pennypack Creek, which flows into the Delaware River (see above photo). Philadelphia’s billboard laws prohibit billboards in areas zoned for parks and open space and also within 660 feet of a park. Philadelphia laws limit heights to 45 feet, (Keystone proposes 55 feet and digital at this location). The City code also requires equal square footage of signs be removed before a new billboard is erected. The legislation exempts Keystone from having to comply with these restrictions. The Committee will also hear testimony regarding Keystone Billboard Legalization Bill No. 160272 which will legalize and digitize an illegal billboard, located at 6601 New State Road adjacent to the future site of Mast Community Charter School. The billboard was denied a permit on May 14th 1997 because it is located within 660 feet of a park, and was 86 feet high (almost twice as high as allowed in the City of Philadelphia). Both the Philadelphia Court of Common Pleas, the Commonwealth Court of Pennsylvania, and the Supreme Court of Pennsylvania denied Keystone’s appeal, exhausting all legal options in 2002. Finally Philadelphia Municipal Judge Alan Silberstein ordered Keystone Outdoor Advertising to remove the illegal billboard or pay a fine of $150.00 a day for every day that the billboard remained. It has been 5,123 days since the billboard Judge Silberstein’s order. Keystone Outdoor Advertising has accrued $768,450.00 in daily fines, never complied with the removal order and now seeks a reprieve from City Council to Court decisions and the law of the land. Keystone obviously doesn’t care about protecting parks, playgrounds, or schools, but hopefully our elected City Council members will. It would be a travesty of justice to pass legislation that would legitimize this billboard. Attend/Testify at Council’s hearing – Tuesday June 7 at 10:00 AM. City Hall Rm 400. Let Council know that you oppose this legislation by clicking here. Mary Tracy, executive director of Scenic Philadelphia and president of Scenic America, recently helped mark the start of the 50th anniversary year of the Highway Beautification Act and the White House Conference on Natural Beauty by leading a series of events in Washington, D.C.
On October 21 more than 130 guests filled the Anderson House at the Society of the Cincinnati for a tribute to scenic visionaries President and Lady Bird Johnson and Laurance S. Rockefeller. 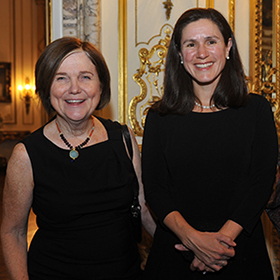 The Johnson family was represented by Lynda Bird Johnson Robb and Lucinda Robb, daughter and granddaughter, respectively, of President and Lady Bird Johnson, and the Rockefeller family was represented by Larry Rockefeller, son of Laurance S. Rockefeller. The evening’s keynote speaker was Senator Tom Udall. His father Stewart Udall was Secretary of the Interior during the Johnson administration and played a pivotal role in promoting the scenic conservation policies proposed by President and Lady Bird Johnson. Click here to read Senator Udall’s remarks in full. 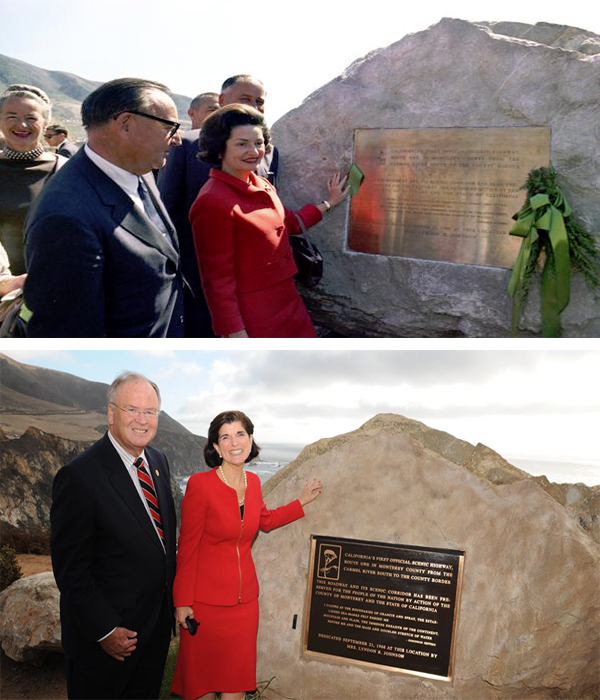 Among the public officials present at the tribute was Congressman Sam Farr, who two days earlier joined Luci Baines Johnson, daughter of President and Lady Bird Johnson, at Bixby Bridge in Big Sur, California for a ceremony to celebrate the 50th anniversary of passage of the Highway Beautification Act. 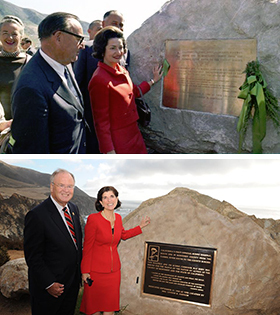 Nearly fifty years earlier at the same site, Congressman Farr’s father, Senator Fred Farr, joined Lady Bird Johnson to dedicate Highway 1 as California’s first scenic highway. On October 22, the 50th anniversary of the signing of the Highway Beautification Act, representatives of more than thirty Scenic America affiliates and allied organizations from all over the country packed the National Press Club for a symposium on the current state and future of scenic conservation. The program began with a video of Henry L. Diamond speaking about his experience as Executive Director of the 1965 White House Conference on Natural Beauty, an unprecedented event in which more than 800 people came to Washington at the request of President Johnson to convey to him personally what they thought their country should look like. The President asked Laurance S. Rockefeller to chair the conference and Mr. Rockefeller asked Mr. Diamond take charge of the day-to-day organizing of the event. 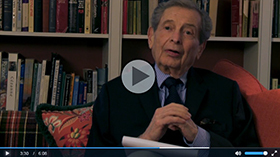 Click here to watch Mr. Diamond discuss his recollections of the 1965 conference. 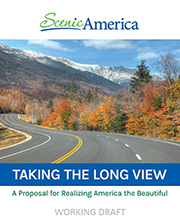 With the spirit of the earlier conference still in the air, Scenic America unveiled a working draft of its new white paper titled Taking the Long View: A Proposal for Realizing America the Beautiful. The work proposes bold but achievable solutions for fixing America’s scenic environment in five key areas: Preserving Community Character, Honoring Parks and Open Spaces, Celebrating Byways and Gateways, Undergrounding Overhead Wires and Promoting Beautiful Highways. Click here to download a working draft of Taking the Long View. 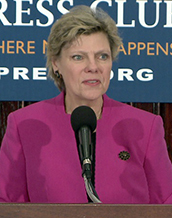 Featured luncheon speaker Cokie Roberts captivated the audience with personal stories of her family’s friendship with the Johnsons and of Lady Bird’s work to beautify the nation’s capital. Roberts said that Mrs. Johnson’s energy, enthusiasm and ability to get things done in a subtle but persistent manner were remarkable. Click here to watch a brief video of Ms. Roberts speaking about Lady Bird’s legacy. The afternoon session included presentations from representatives of allied organizations including the Trust for Public Land, the American Planning Association, the American Society of Civil Engineers, Scenic Hudson, the Garden Club of America, Saving Historic Roads, the American Society of Landscape Architects and Scenic Toronto. There was much discussion of how our organizations can better work together to advance the scenic conservation movement. Also on October 22 a joint resolution was introduced on the floor of the U.S. Senate by U.S. Senators Lamar Alexander (R-Tenn.) and Tom Udall (D-N.M.) recognizing the 50th anniversary of the Highway Beautification Act of 1965. The resolution unanimously passed the Senate. Click here for remarks by Senators Alexander and Udall on the resolution. Click here for the full text of the resolution. Scenic America’s conference and white paper are already making an impact with policy makers and leaders in the scenic conservation world. 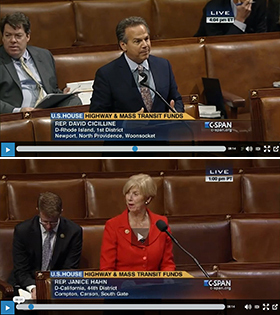 During debate on the transportation bill on the House floor on November 4, 2015, Rep. Janice Hahn (D-CA) and Rep. David Cicilline (D-RI) introduced an amendment to require a federal study on the undergrounding of utility wires. Both Congresswoman Hahn and Congressman Cicilline complimented and said they were inspired by the work of Scenic America to beautify the nation’s roadsides and landscapes. The amendment was ultimately withdrawn due to opposition from Transportation & Infrastructure Committee Chairman Rep. Bill Shuster (R-PA), who said he believes in the benefits of undergrounding but didn’t think the transportation bill was the appropriate place for it. Watch the debate on the Hahn/Cicilline amendment here. Scenic Philadelphia and Scenic America will continue working hard in the year ahead to uphold the ideals of the Johnsons, Rockefellers and other scenic visionaries who set the foundation years ago for America the Beautiful as we know her today. The interview was spawned by a recent effort by ISA to overturn a moratorium on on-premise digital signs in Chicago, which is covered nicely in this report. Anyone complaining about light pollution in Chicago, however, will find no friend in the Mayor’s office. In a 14-page opinion released this week, the U.S. Court of Appeals for the Third District in Philadelphia upheld Mount Laurel’s 2008 billboard ban the township’s stretches of I-295 and the New Jersey Turnpike. Interstate Outdoor Advertising L.P. appealed, saying the ordinance was unconstitutional because it limited free speech and was based on flawed traffic studies. The court said that the town’s “conclusion that billboards affect traffic safety and aesthetics” was reasonable, and that municipalities have the right to regulate billboards. Interstate Outdoor, a regional billboard company, had sought permission from the town’s zoning board to erect four billboards along I-295, a six-lane highway, the opinion said. Drew A. Katz, chief executive of Interstate Outdoor, also is a director of Interstate General Media, the company that owns The Inquirer. His father, Lewis Katz, a partner in Interstate General Media, is former chairman of Interstate Outdoor. Interstate Outdoor presented an expert witness who testified that an analysis of accidents on I-295 revealed it was not a hazardous highway in Mount Laurel. But the court noted that it was possible the “precise reason the accident rate is so low” is the lack of billboards. The ruling means Mount Laurel “will retain its existing ‘billboard-free’ ” character, said Christopher J. Norman, the township’s special counsel in the case. Only two small billboards appear within the town’s borders because they were erected before the ordinance was adopted. Norman said “the opinion sets the law on regulating billboards” in New Jersey, Pennsylvania, and Delaware. Louis L. D’Arminio, who represented Interstate Outdoor, did not return a call for comment. The court agreed that the town’s ordinance limited Interstate’s speech but said that was overshadowed by regulatory interests. “Interstate alleges that the complete ban on billboard messages does not allow for alternative channels for communication . . . to the specific target audience of the drivers traveling on I-295,” the court wrote. But there are many alternative ways to get the message out, including Internet advertising, direct mail, radio, newspapers, and television, the court said. Great news!! Philadelphia’s skyline is saved from the intrusion of a seven story digital advertising sign and our transportation projects will not be denied federal highway funding. Thankfully, Councilman Squilla did not call for an override of the Mayor’s veto Thursday, his last opportunity to do so. Your letter and phone calls to City Council made a critical difference and Scenic Philadelphia is extremely grateful to you for your active support. Thank you. Many thanks to Mayor Nutter for his veto, as well as the Pennsylvania Department of Transportation, and the Federal Highway Administration for safeguarding Philadelphia’s scenic skyline and upholding the Federal Highway Beautification Act. Blinking digital signs may still be a threat to some neighborhoods. City Council will be passing a new outdoor advertising sign code in the near future. Please stay tuned for further information. We had a victory…but it’s not over! Do we want this to be the future of the Electric Factory building? Round One: Mayor Nutter Vetoed the Digital Wallwrap Bill 120920 because, among many good reasons is the fact that Philadelphia will lose upwards of $100 million dollars in federal highway fundingby allowing this one giant digital advertising sign. Councilman Squilla did NOT call for a vote to override the veto. Round Two: Next Thursday, Jan 31st at 10:00 Room 400 City Hall, Councilman Squilla will have his last chance to call for an override of the Mayor’s veto of Bill 120920. Please continue to contact our seven at- large council members and ten district council members. The Bill’s sponsor, Councilman Squilla may still try to round up the 12 votes needed to override the Mayor’s veto and has until next Thursday to do so. So take a few moments this week to contact our at-large and your district council members. Thank you for your advocacy in protecting Philadelphia’s scenic gateway! Click Here to read Mayor Nutters letter to the City Council! Click Here to read PennDot’s letter to the President of the City Council! The investigative journalism group FairWarning exposes the billboard industry for citing discredited research in their efforts to diminish a recent Swedish study that found digital billboards to be quite distracting. “In an effort to dismiss the findings, the industry’s top trade group quickly cited an unpublished U.S. government study to argue that the electronic displays pose no traffic safety hazard. Click here to read their report. Court Orders Removal of 100 Digital Billboards Across L.A.
A three-judge panel on Monday ruled that roughly 100 digital billboards installed in Los Angeles under a 2006 legal settlement approved by the Los Angeles City Council must be removed. The panel from the state’s 2nd District Court of Appeal said sign companies CBS Outdoor and Clear Channel outdoor should not have been allowed to convert their existing billboards to electronic formats when existing laws prohibited such changes. “We do not see how the language could be plainer,” the ruling states. The panel instructed a lower court to order the removal of digital billboards already permitted under the agreement, many of which were on the Westside. Dennis Hathaway, president of the Coalition to Ban Billboard Blight, hailed the ruling. “Needless to say, [it’s] a very happy day for us,” he said in an email. Of the billboards that are at issue, 79 are operated by Clear Channel. The remainder were owned by CBS. CBS and Clear Channel sued the city nearly a decade ago, seeking to block implementation of an ordinance banning the installation of new billboards except in special sign districts. In 2006, the council backed a settlement with the two companies that allowed them to convert up to 840 existing billboards to electronic formats. Summit Outdoor, a smaller sign company, went to court to invalidate the agreement, calling it a sweetheart deal. A judge sided with Summit, calling the agreement “poison” and blocking the city from allowing new digital signs to go up. But he refused to order the removal of the 100 or so billboards that had already been converted to digital formats under the 2006 settlement. When City Council decided last June that owners of billboards and other structures condemned to make way for I-95’s expansion could replace them without going through the usual permitting process, that controversial law did not apply north of Allegheny Avenue. SCRUB, the public voice for public space, has changed its name to Scenic Philadelphia. The group was founded in 1990 as the Society Created to Reduce Urban Blight, a grassroots coalition aimed at stopping the proliferation of billboards in Philadelphia. Since its inception, SCRUB has been responsible for the removal of 1000 illegal billboards in the city, and its legal volunteers have represented community organizations and local taxpayers in 40 court appeals. Local residents, community organizers and outdoor advertisers are turning their attention toward an outdoor advertising debate in the Lower South District that may have implications throughout the city. Could Massive Wall Wraps be Returning to this Building? The 600 block between Willow and Spring Garden Streets has been the subject of previous attention for wall wraps. A wrap was illegally erected, and SCRUB, via a lengthy struggle through the Zoning Board of Adjustment and the courts (going as high as a denial of certiorari at the US Supreme Court) helped get it down, and ensure that it was determined to violate the Philadelphia Zoning Code. Bill 110563 (PDF) represents an attempt to circumvent the zoning code’s protections. Bill 110563, in addition to being a potential example of illegal spot zoning, and attempting to skirt the previously adjudicated violations of Philadelphia zoning law that these massive advertising wraps would create, may also prove a violation of the Federal Highway Beautification Act. In Philadelphia, adherence to this act must minimally conform to the January 1972 agreement between PennDOT and and the Federal Government; this agreement applies to areas “within 660 feet of the nearest edge of the right of way of all portions of the interstates system in which signs are visible from the main travelled way of said system, zoned commercial or industrial.” The area in question is zoned L4 Industrial; about half the block falls within 660 feet of the main traveled way of the Vine Street Expressway. The most likely site for the wall wrap, the face of the building on the Southern edge of the block facing Willow Street and the Vine Street Expressway is clearly visible from the Expressway, and is within 660 feet.